If you've been following my facebook status updates, then you would have heard by now that Shern is down with Hand, Foot and Mouth Disease (HFMD). I've been kinda expecting this to come sooner or later since he started playschool. I've read many other parents blogs bout their kids getting HFMD once they started daycare of playschool. And seems like it is common among kids below 5 years of age. So when Shern started to develop a fever last Sunday, I kept on checking his hands and foot for rashes or spots but couldn't find any. His fever was mild and he was still behaving normally, which is still his active self. 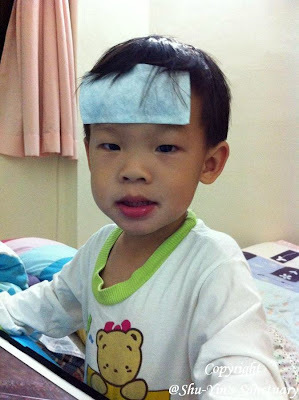 Look at him still posing for the camera even having fever. 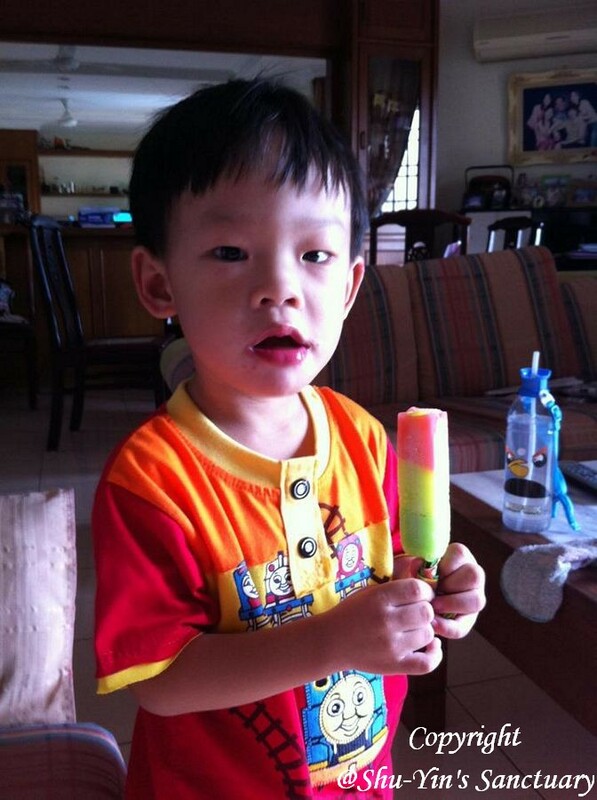 On Monday, he was still having mild fever on and off. So he did not attend playschool. He was still running around and playing with his cars and trains like usual. But he told me one thing that should have given me a symptom but I put him off. At night, while walking back to our home, he told me his left foot 'pain pain'. I took off his shoes and cleaned his foot, thinking it was sand that irritated him. 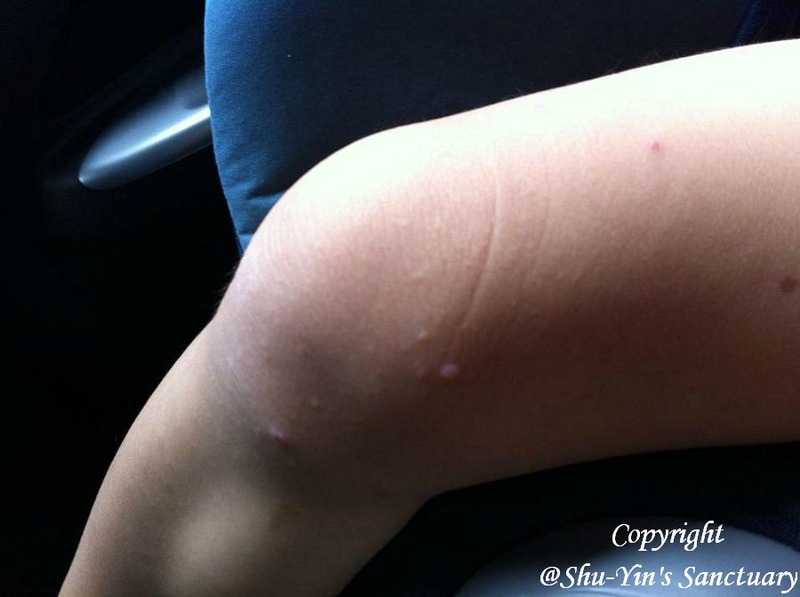 On Tuesday morning, I immediately saw rashes and spots on everywhere of his body. I then know he has HFMD. So I brought him to see his paed. 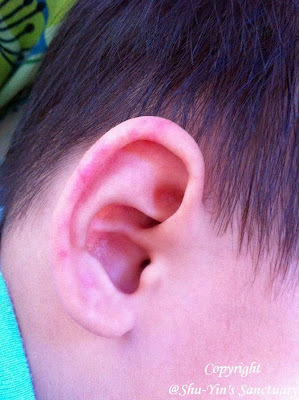 Doctor checked him and confirmed it is HFMD. Recommended him to be hospitalized so that they can monitor him properly but I was not keen. If he is not on drip or anything serious, I prefer to take care of him at home. If Shern is hospitalized, means I am hospotalized, together with him. Just me and him in the hospital room will drive both of us crazy. So I rather him not be admitted unless it is absolutely necessary. Doctor then asked me to apply the Daktarin gel in his mouth every 4 hourly and to bathe with with the diluted Potassium Permanganate water to dry his spots. And I am to bring him back 2 days later in case he gets worse, and might need to have his blood tested. I obliged. Look at my poor baby on Day 1 of HFMD. 17 April 2012 - Ulcers in and around his mouth, and even on his ears. 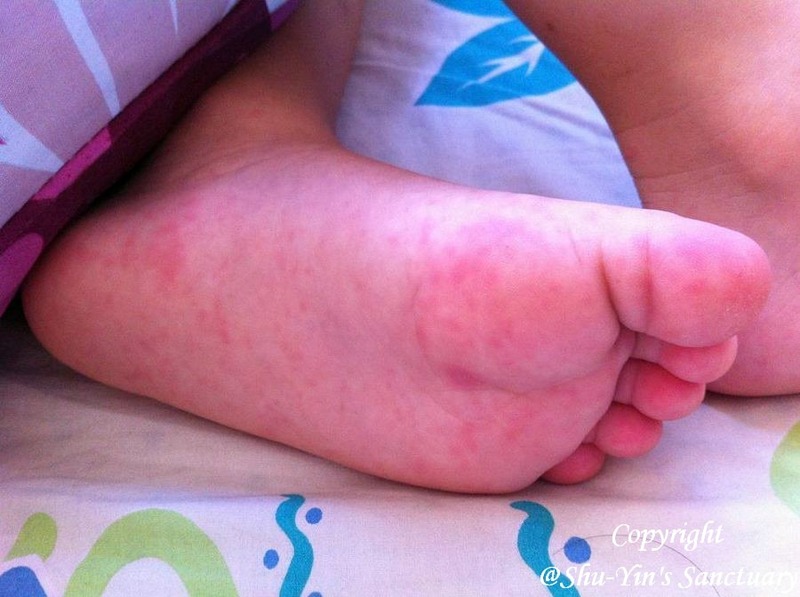 Rashes and blister-like spots on his legs and feet. 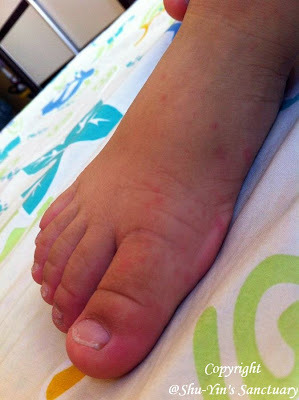 Rashes on the base of his feet. Shern was VERY whiny the whole day. 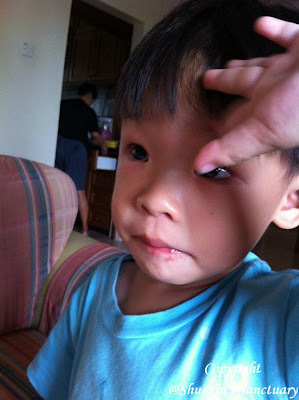 In fact, he became a cry baby and stuck to me like a magnet the whole day. I tried to be patient with him as I know he is in pain, but sometimes he drives me crazy. 2 days and I am really so tired. With doctor's recommendation, we gave him cold things like vitagen, yogurt, ice-creams. So when he gets to eat those things, he is quite happy. 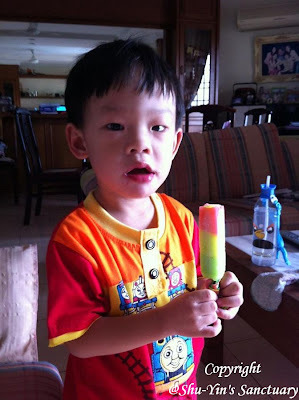 I later made my own fruit juice popsicle for him too. I am still thankful Shern is still eating. I let him eat whatever he wants to eat, as long as he is eating. He wants cake, I gave him cake. He wants yogurt, I gave him yogurt. Better than him not eating at all. Rice he does eat but not much. And I noticed he drinks less milk, guess the sucking hurts although I tried to make the milk as cool as possible. 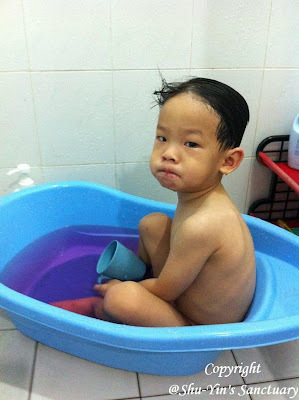 This is him bathing with the diluted Potassium Permanganate solution. Shern likes the purple water and said he would emerge out as the purple Barney. Haha. 2 days later, which is today, we brought him back to his paed. His rashes became more blister-like and still not so dry yet. But he was really in a happier mood today. No whining at all in the morning. And he was in a very happy mood at the clinic, although we waited there for almost 1 hour before we could see the doctor. And now that he is feeling much better, I kept on pumping him with water. Luckily he drinks, coz I told him the water will wash away the 'ek ek' (dirt) in his mouth. He complains of ek ek in his mouth, which I guess are the ulcers. Hope you get well soon baby. 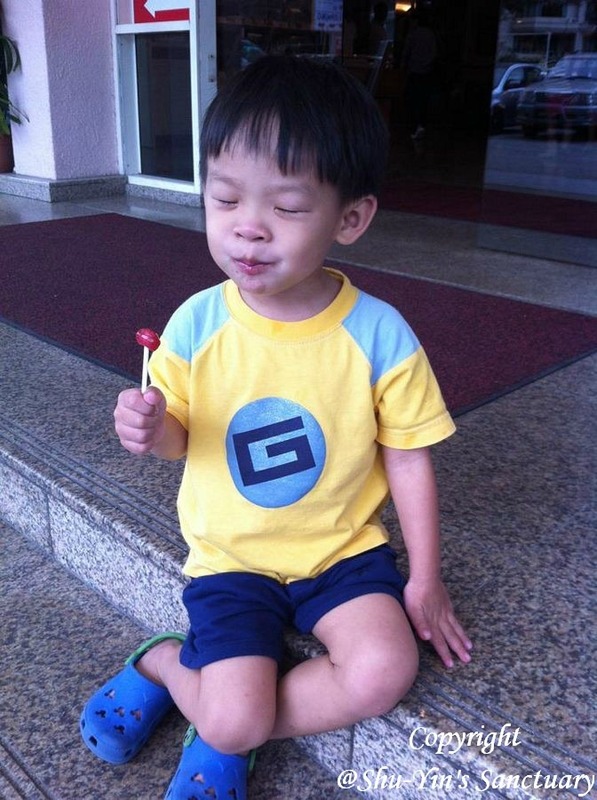 I'm a friend of Tze Lynn. I came across your blog when I was reading her blog. 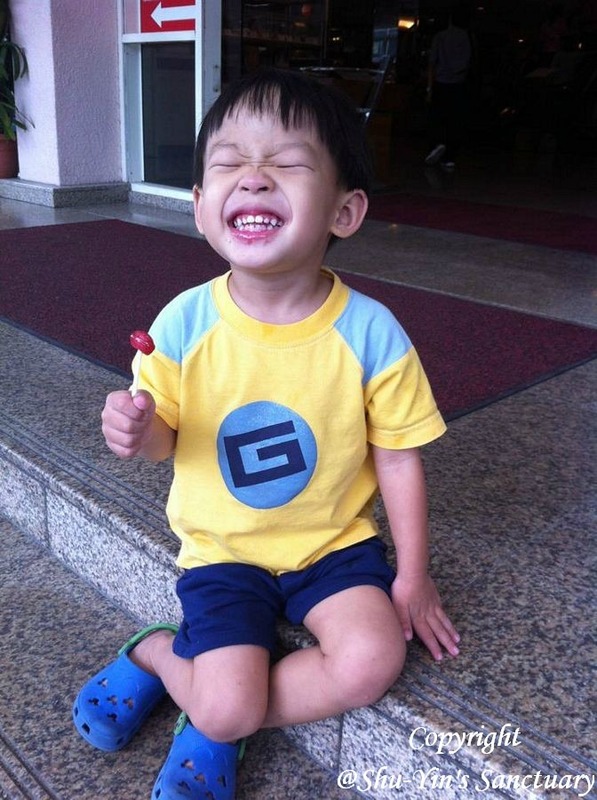 And I noticed this particular post about HFMD. My son now has HFMD. Today is his 3rd day. He complains of the spots being itchy and painful. Because of that, he is very whiny and sticky to me. How did you help Shern relieve the itch and pain? Also the Potassium Permanganate solution - was that prescribed by the pead? Coz my son's pead didnt prescribed any. Did bathing him in that solution helped? Erm..I dunno any friend by the name of Tze Lynn. Do u mean Tse Ling? Anyway, the Potassium Permanganate solution was prescribed by his paed. The doctor said bathing him with that diluted solution helps the rashes/spots to dry up faster. I'm not sure if it helps with the itchiness or not. 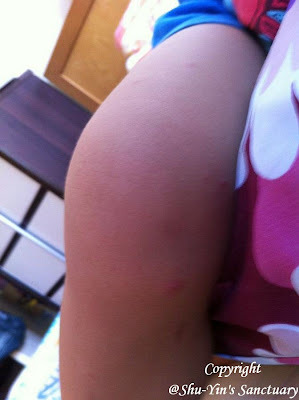 But it seems to help because by the 3rd day, Shern did not complain of any itchiness anymore. He was very whiny n clingy to me too during the first 2 days. On the 3rd day, he was better and less whiny. Other than that solution, he was not being prescribed any other meds, except for the Daktarin Gel for his ulcers in his mouth. 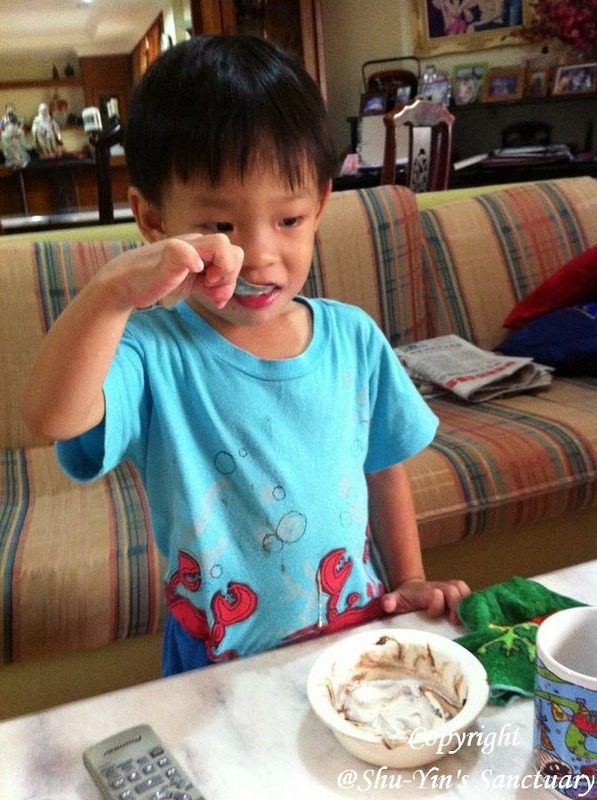 That also by the 3rd day, less complains and can eat already. Little Bub is a BOY!